It is starting to shape up a bit like Summer around here. We had high temperatures over the weekend – up into the low 20s – and even though the air temperature has dropped considerably to the low teens, we have had blistering sun every day this week. I have a thing for cotton cardigans. I don’t own any, it just fits into some sort of Bridget-Bardot-post-war mental image I have of Summer on an island (which we are, even though it doesn’t feel like it most of the time). You know, warm enough for cotton but cool enough to need a cardigan. This is where Audrey in Unst comes in. I just looked up what ‘unst’ means and it doesn’t mean anything because it’s a place – one of the islands in the Shetlands! That’s funny. Anyway, the yarn is a deliciously pale pink called Amalfi by Debbie Bliss. I got it from This is Knit. I needed to go down to a 3mm needle to get gauge so it’s fairly slow going but I’m cranking it out a little at a time. During my spring clean, I happened upon my mountain of crochet blocks. I had maybe about thirty so at the weekend, I sat down and started joining them up. It took no length at all to get them all attached. 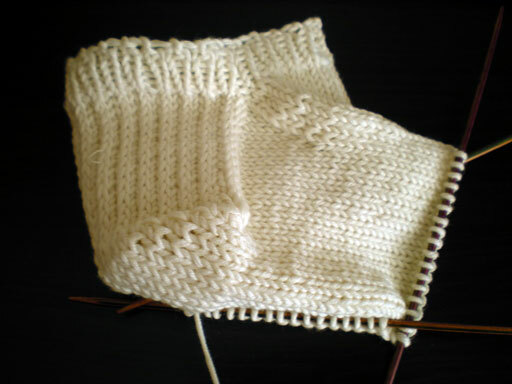 I had about 10 large squares from 200 Crochet Blocks and a lot of smaller motifs from Beyond the Square. 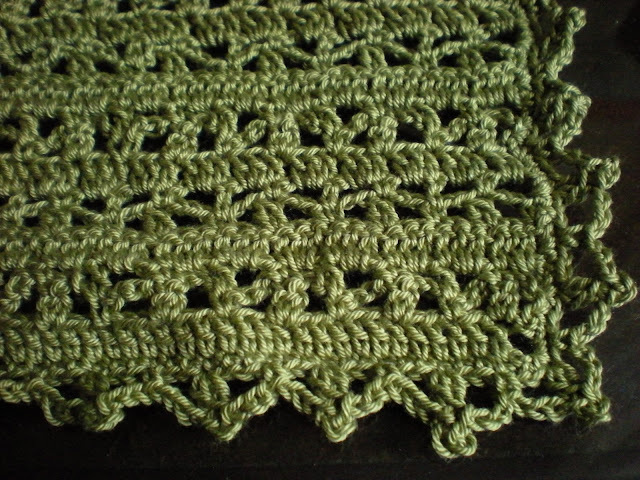 I crocheted the large motifs together for the centre and then used up all the smaller ones as a border. It is still not much bigger than a generous lap blanket so I have decided to work up about fifteen more large square, attach them, and then work the border in brown. I have seven after the weekend of absently working away and watching tv. These guys are perfect for working up in warmer weather and it is very pleasant joining them all up with the blanket on your lap when it is cooler in the evening. More, please! Hello again! I didn’t pass the eliminatory round in the competition in Italy so I came home the day after I got the results. I know some people were very disappointed not to pass through to the next round but I genuinely wasn’t. For a start, I knew that I didn’t play well enough and, even though I had practised a lot what I would have needed to do in the next round, I still was not at all comfortable with what it would have entailed. So, I was just as happy to go home. It was a fantastic experience and I am already preparing for my next one. My goal for this is to make it through the eliminatory round. In the meantime – thankfully – there is always wool. When I got back, I gave the house a thorough (albeit late) spring cleaning. 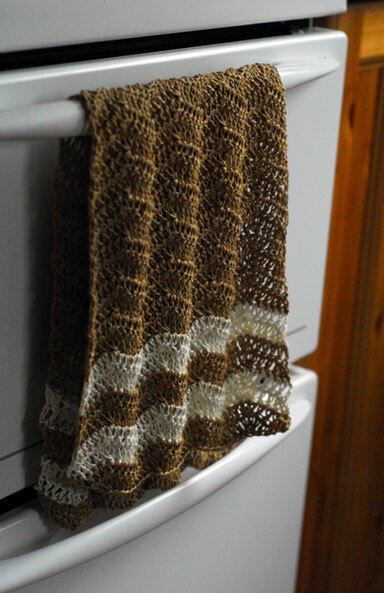 I decided to whip up a few handtowels using my souvenir linen from the Cantu market. I had two balls of each colour. The top towel has already been used and washed in the machine. You can see how it stretched lengthwise on the line and pulled it in. But the stitches have really fluffed out! Next time, I’ll hang it horizontally and hopefully it will return to its original shape. For the record, there was about 105m in each 50g ball and I used 1.5 balls of the main colour and half a ball of the contrasting colour for each towel. The pattern I used is a free pattern from the Lion Brand website here. I think you have to sign up to the site to see the pattern but signing up hasn’t had any consequences for me yet – apart from nice handtowels! I used a 4mm hook throughout. The linen was a bit scratchy to work with but not nearly as unpleasant as I had initially anticipated, and it really softened up and bloomed with washing. I think I will make a few more of these! My father gave me this great learn-Italian set of CDs and a book from the BBC a while ago. Before I came out, I covered the first section easily enough. I had hoped to do more but was so busy working and trying to squeeze in extra preparation that it ended up taking a back seat. On the plane over I realised that the extent of my Italian was how to ask for five different types of coffee, ask where the toilet is (but alas not understand the answer!) and count up to ten. My hosts’ English is limited but when they speak clearly in Italian, I understand them quite easily. I think this is because the root of many words is similar to that in French, which I know well. Now we converse in a funny sort of Italiano-inglese. By the time I went to the market on Saturday, I felt confident enough in my phony French-with-Italian accent to buy wool. In fact, when I do this generally, I fare better. If I ask if they speak English, often people get flustered and then defensive. Easier if I’m the one who speaks poor Italian rather than the reverse, if you get me! Anyway, this is what I came away from the market with. Cotton and linen are the most popular fibres here for obvious reasons but the guy was also selling ‘winter wool’ because the weather has been so poor here (They consider 18C and cloudy to be poor for this time of year. Yeah. My sympathy doesn’t go that far either.) I have been going through a real phase of fascination with Zakka and all things for the house. 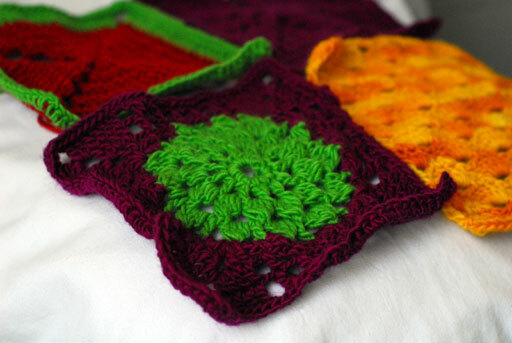 I have a nice book called Lacy Crochet which calls for fine cotton for a lot of the projects. I got these three. 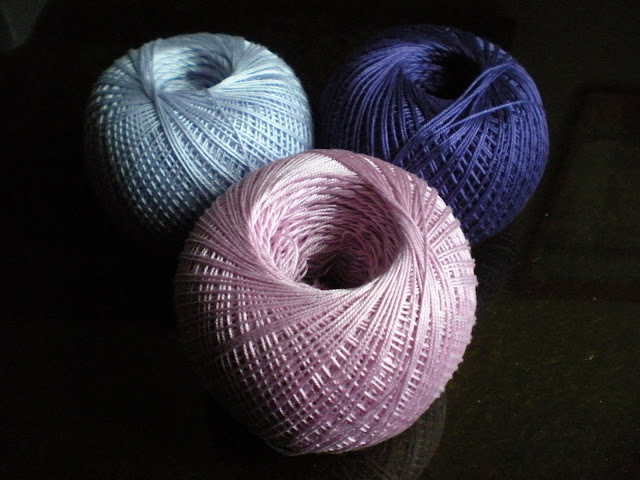 100% cotton, 340m per 50g, a staggering €1.60 a ball. 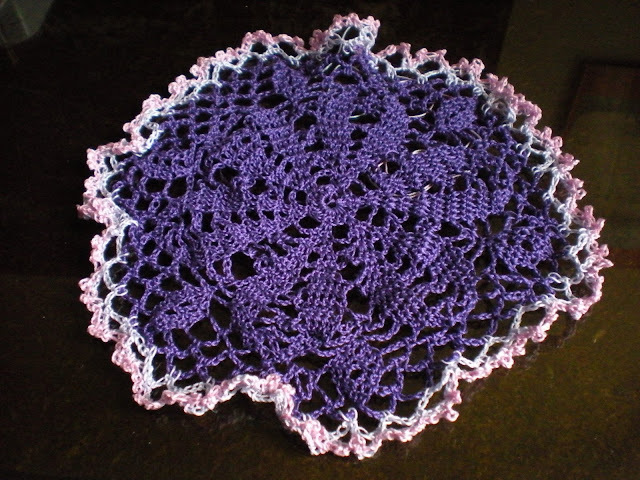 Of course I had to try it out straight away so I whipped up this wee doily from the book. Apologies for its crinkliness, it really needs a good blocking and perhaps some starch. He also had heavier weight cottons but those I can get fairly easily at home so I went for some linen instead. This I bought specifically with tea-towels or a mat in mind. I bought two of each colour. 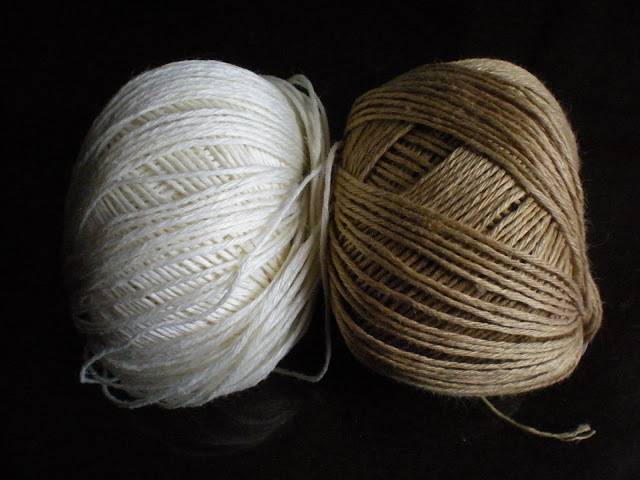 100% linen, 105m per 50g, €3 a ball. I know the temptation is to buy a ton but this stuff is going to be pretty rugh to work with. I imagine by the time I get through 420m of it, I’ll have had enough for the time being. The market was very interesting. It’s not a good market by my family’s estimation but really, it had everything you could think of. I enjoyed looking at the cheesemongers’ stalls and also at the vegetables. Every vegetable stall sold huge nets of… snails. Initially I thought they were oysters because they were wet and drippy. But then I thought that they couldn’t be since we’re so far inland. That’s when I noticed the many, many antennae straining and wiggling. Whose fantastic job was it to bag up all those guys? I also wonder how long they last for. You’d probably need to cook them all together. But from prior experience, you can only eat so many snails in one sitting. Anyway, there was also a guy selling pet birds and different types of eggs. Hen eggs, fine. Tiny little white eggs I found out later that are quail eggs…. and absolutely gigantic, creamy, dimpled eggs that looked like dinosaur eggs. ‘Uovo di Struzzo’. I looked it up when I got home: ostrich eggs. I’m not kidding, they were about 20-30cm long and 15-20cm wide. Apparently you make big omelettes from them. No duck eggs, curiously enough. I also finished up a square doily I started a few days before I came over. It’s quite large so here’s just a corner to give you an idea. Tivoli Cruise cotton, 4ply, and the pattern is from the Lacy Crochet book I mentioned above. I used a 2mm hook. It’s to protect one side of the desk of my piano (the desk is the music stand on a grand piano, it has a shelf on either side of the stand and the whole thing can slide in or out). II’m going to make a matching one in blue for the other side. I played this morning so now I am taking it easy. I find out tomorrow evening if I pass into the next round. I don’t expect to – I’m not being pessimistic, rather, realistic. I was happy enough with how I played, considering the overall situation. It takes courage! Especially if you follow a German lass who quite literally slashed her way through a Beethoven concerto with a sledgehammer. Oh Madonna… I did the best I could do for now. It could have been better, but also much worse. The next one I do will be better because I’ll have done this; and the one after, a bit better again. 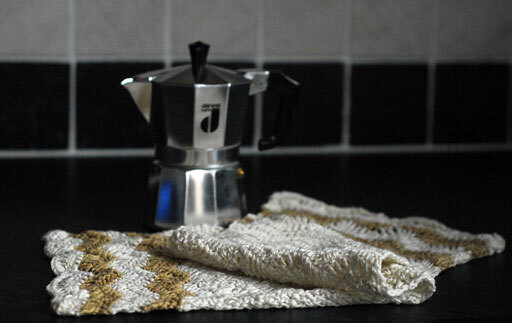 For now, espresso and a doily await! I managed to fly out to Milan on Thursday in between all the ash chaos. I’m not staying in Milan, though. The competition I’m participting in is in a small town about the size of Sligo or Athlone, about half an hour’s drive from the Swiss border. Needless to say, getting here on public transport was… an experience. Most people here don’t speak very good English and some get downright irate at the notion of speaking anything other than solo Italiano. I got a bus from the airport, a metro to the north and then a regional bus further north again. The bus stop for the last bus was a pole, nothing more, lying against a wall. I walked past it four times until some people gathered and I figured that it must be the stop. Sigh! I have no good pictures of the nice little square of the town because – and I’m not exaggering (oh, I wish!) – it has been cloudy with intermittent torrential rain ever since I got here. 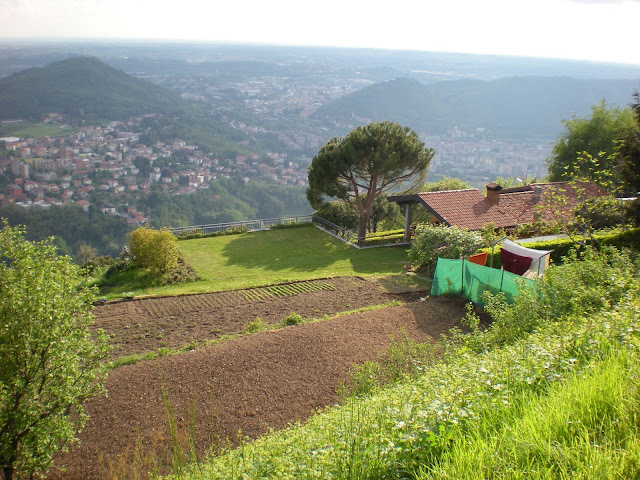 Yesterday was the best day yet so, when I was finished with my appointment in the morning to try out the competition piano for a few minutes, we went to the nearby city of Como. 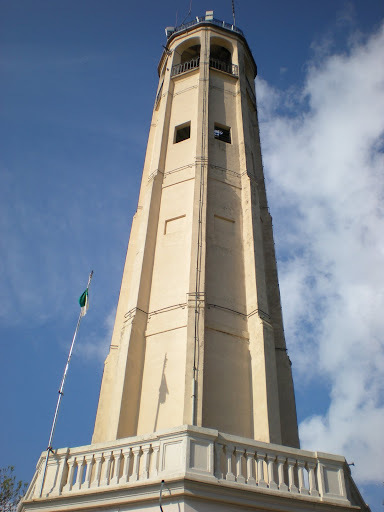 It is about the size of Cork and very famous for its lake. 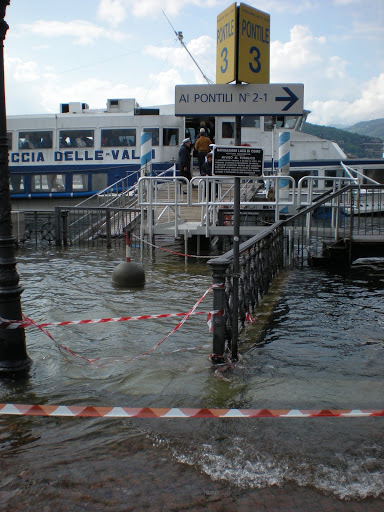 With all the rain recently, there’s been a lot of flooding along the prom. We walked through the city and all through the market. It has a very large market for everything from wellies to wallets and it attracts a lot of people from Switzerland when the exchange is good. So it was funny to hear a lot of Swiss German all of a sudden. The market takes place on the border of the old town. The old part of the city is very well preserved and also a very upmarket place to shop. We just went to look. In the middle is a spectacular cathedral. This is only a tiny part of it. At the front beside the door in, there is a statue of the man who documented the eruption of Vesuvius and destruction of Pompeii. I can’t remember his name but he was born in Como. Inside, there are many tapestries that were woven by local women during the last millennium depicting scenes from the Bible. They were really faded so I didn’t want to take a photo but they were huge and very detailed. Erminia, my “host mother”, showed me a shop that sold Como silk. Apparently the place is very famous for its quality of woven silk fabric. They don’t grow it here, they just weave it. They sell it to the big Italian design houses and there were many spectacular Valentino ties for sale. I explained to Erminia how most Irish men simply cannot wear ties like that. She looked sad at the very idea. She brought me up the wee train that goes up the mountain so we could see across the lake into Switzerland. The host family I am staying with are great. 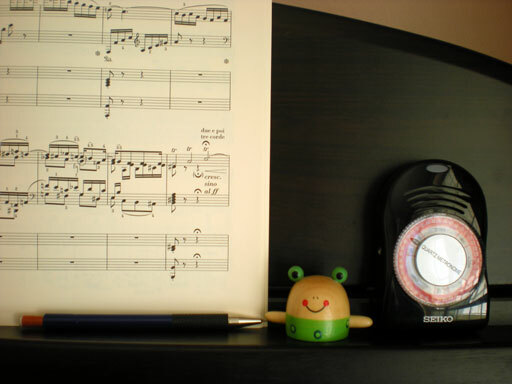 It’s a quiet house with a piano and I can practice as much as I want, so long as it’s not in the middle of the night. I was concerned about the cooking arrangement because I have allergies and really didn’t want to be annoying, but Erminia insisted that she cook and we all eat together. Lunch and dinner consist of many small courses, especially dinner. Typically you have pasta or rice first, then the meat (by itself), then cheese, then fruit, then dessert, then coffee. Friday night, we had company and a local licquer emerged, called grappa. The skins of of grapes that were used for wine are fired in a kiln and left to ferment. Often it is fermented with blueberries and lemon or orange. Needless to say, they are very proud of their local produce and have made it their mission for me to taste the local cheeses they like best. Yesterday, I was presented with a whole ball of mozzarella from their local mountain, made from buffalo milk. You put oil and salt all over it and cut it up into tiny pieces. Delicious – but a bit strange! Another favourite so far is gorgonzola. Very like Cashel Blue only creamier, almost like a cream cheese. Because I couldn’t eat it with bread, I was given walnuts as the only sensible alternative. Again, strange, but delicious. I play tomorrow morning and have spent most of today practising and listening to the others play. I find out Tuesday evening if I get into the next round. If I get in, I play again on Thursday or Friday with orchestra. Then the final is on Sunday. If I don’t get through, I will probably come home on Thursday. This gives me time to listen to most of the others in the first round. I have much more news and funny things to tell but they’ll wait until tomorrow when I’m finished. Ciao! April was a pretty horrendous month, work-wise. I was travelling a lot for rehearsals and concerts. I was teaching in NUI Maynooth – which, although convenient for me to get to by train, is still a fair distance away. Then I had my own lunchtime recital with my duo partners last Thursday and a concerto run through on Friday night. 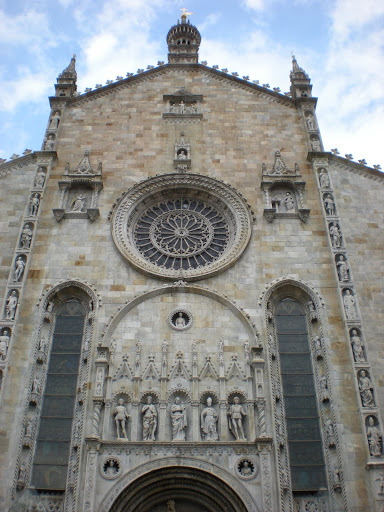 Last Christmas, I decided that it would be a *really good idea* to do a concerto competition in Italy this May. The problem about deciding to do things in the future is that eventually, the future turns into a flight on Thursday morning! Anyway, this weekend was my first weekend in well over a month where I wasn’t working so we vamoosed to Galway. Despite my best intentions, I spent much of Saturday and Sunday asleep. Today has been better and practice is going well. This weekend has been the first chance I’ve had to concentrate solely on the piece I’m bringing so it’s a bit strange, having so much brain space! The way these competitions work, you play one movement for the first round, and then another for the next; then there are semi-finals and the finals. I don’t expect to get through the first round at all. I’m not being pessimistic: solo playing hasn’t been my concentration at all this year. The reason I’m doing the competition is to keep my solo technique up (which it has, oh boy, it’s hard work) and for the experience. I’ve never done anything like this before. I’m really curious to see how it all works. Also, because I don’t really care about the outcome, I’m not wasting so much energy worrying about it! Needless to say, my knitting has been pretty brainless lately. I have been concentrating on my Featherweight cardigan. I’m using Malabrigo Lace in Hummingbird from This is Knit. 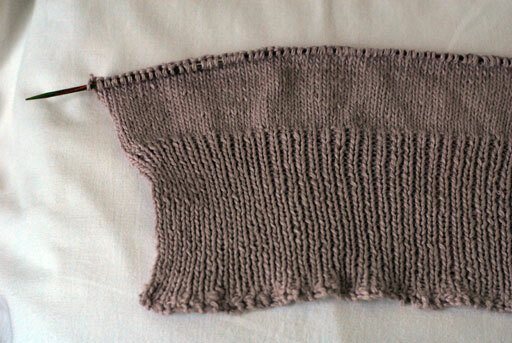 It pooled really horribly when I started it so I ripped it out and reknit it, alternating skeins every two rows. I’ve already completed the body and a sleeve. Right now, it is all bunched up on a small circular for the bands on the front. 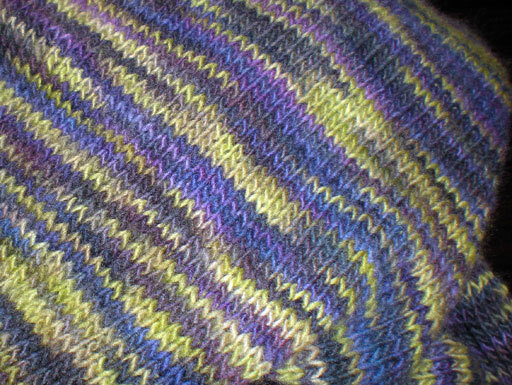 You can at least see here how alternating the skeins breaks up a lot of the pooling. Hopefully I will get this finished up soon and you’ll be able to see it in all its glory! I got new shoes lately and with the weather slowly getting warmer, I had a hankering for some cotton socks. Cotton doesn’t really work very well for socks so I’m keeping them to anklets. 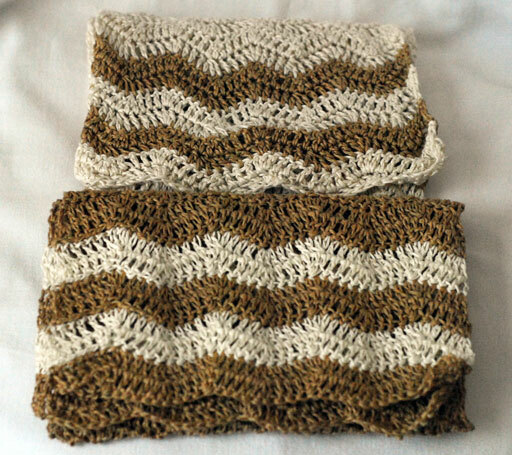 The yarn is Debbie Bliss’s Eco Cotton Baby, which is a sort of heavy 4ply, a lot like the Baby Cashmerino. I quite like it. It is a bit splitty but otherwise very soft and not hard on the hands. I’m wondering if I’ll get a pair out of one ball! Hope everyone saw a bit of sun this weekend and got at least half of what I slept…!